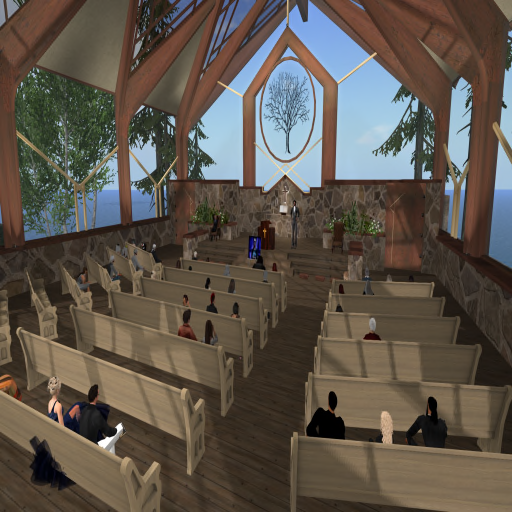 Welcome to God’s House of Prayer church in Second Life, a virtual reality. God’s House of Prayer is a church where Christ is the head. We are a Bible believing fellowship of Christians who not only worship but serve our Lord in all ways. God’s House of Prayer is place for individuals from all walks of life to come in and praise the lord in their own manner. The church is accessible 24/7 to provide a safe haven for those that need to escape and spend some quiet time with God. God’s House of Prayer is provided as a FREE place to be for those who wish to worship, fellowship, pray together! Our Purpose: "Spreading the Good News of the Gospel throughout the world!" The Lord Jesus Christ commanded two ordinances to the local church; baptism and the Lord’s Supper. Christian baptism is the immersion of the believer in water, which is a public testimony of the believer’s new life in Christ. The Lord’s Supper was instituted by Christ for commemoration of His death. The elements of communion are symbolic of the body and blood of Jesus Christ. These two ordinances should be observed and administered until the return of the Lord Jesus Christ. (Matthew 28:18-20; Romans 6:3-5; 1 Corinthians 11:23-26) This means you must find and participate in a real life church where your fellowship can grow as Christ commanded in the physical presence of other believers. This is our purpose, our strategy and our invitation for you to be a part of this Ministry. We may be a virtual church but we are also a real church (501c3) headed by a real life Pastor. Many organizations are guilty of making things complicated and lives cluttered. The Pharisees developed a religious system of over 600 laws. Jesus came and made the complex simple. One of the Pharisees asked Jesus what was the greatest commandment of all; that is, out of all the laws, which one was supreme. Jesus then gave us the greatest commandment of all by referring to Deuteronomy 6:5; 10:12; 30:6. Jesus not only answered his question identifying the greatest commandment of all, but He then offered the second greatest commandment of all. God has endowed each born again believer with unique spiritual gifts to be exercised for the building up of others within the Body of Christ. We want to put these to work on a worldwide level. The last part of our church’s goal: Inviting others to worship and learn through active Bible teaching, comes from the Great Commission that Jesus gave His disciples before He ascended back to His Father. We want every believer here at God’s House of Prayer to Worship God, Love Others, Serve God, and Invite others to worship and attend classes. We want to encourage you to help us accomplish our purposes through an involvement that is practical and tangible. Question: Are you truly being transformed by the death, burial, and resurrection of Jesus Christ? Are you truly being conformed into the very image of Jesus Christ? We believe that worshiping God, loving others, serving God, and inviting others, will develop you into the mature believers that God would have you be! Many churches are full of activity but devoid of accomplishment. We want our activity to move us toward what we are trying to accomplish— bringing the message of the Gospel to all those around the world seeking freedom from Satan’s clutches! Churches are floundering and Christians are anemic because they have focused on moral flexibility and fleshly fellowship instead of practicing a sound biblical process for growing believers and presenting the faithful message. To fulfill our goals we will not arbitrarily ban lost people but embrace them, we forgive and love them – even when we hate their sin. We will teach the pure truth of the Bible and not try and reinterpret it to fit our society. We will teach you the truth because we love you! You are invited to worship with us – take an active role and study the Bible – grow and learn about a new life and better life which Jesus has provided those that will believe in Him.